Gov. 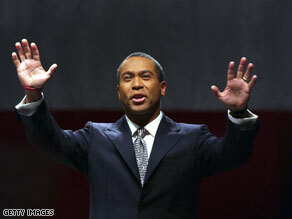 Deval Patrick is in favor of a state law that would allow him to appoint an interim replacement. (CNN) - Massachusetts Gov. Deval Patrick said Wednesday he is in favor of a change in state law supported by the late Sen. Ted Kennedy that would allow him to appoint an interim replacement to fill the state's vacant Senate seat. Under current Massachusetts law, a special election must be held 145 to 160 days after a Senate seat becomes vacant, with the winner serving the remainder of the former senator's unexpired term. "I believe that the senator's request to permit the governor to appoint someone to serve for that five months until a special election was entirely reasonable," Patrick said in an interview with Boston radio station WBUR. "I think particularly now when you think about the momentous change legislation that is pending in the Congress today, Massachusetts needs two voices. " Asked if he would push the state legislature to make that change, Patrick said he would, and that he would sign the bill into law. Last week, Kennedy - who died Tuesday at age 77 after serving nearly five decades in the Senate - urged that the law be changed to allow the governor to appoint a temporary replacement until the special election can be held. The idea of wasting time to preserve a vacant seat, is absolutely ludicrous. This idea was Ted Kennedy's last wish. The late Senator wanted a successor if anything happened, and it did happen late last night. No more time must be wasted, as America is still split with the idea of time wasted for important issues. Fine lock up Bush and Cheney. Just keep the MASS law as it is now and don't even try reconciliation to get your agenda shoved down our throats when a majority of americans' don't want the Democrat VERSION of reform, ie takeover. First off Bush and Cheney aren't in office anymore...would you people give it a rest! It was the democrats who wanted to pass this law in my state so that the governor at the time Gov. Romney wouldn't be able to appoint a senator if John Kerry had won. Well Kerry didn't win and Romney didn't appoint anybody. The dems (who are still in power in the state) could have changed the law back but didn't. It is now too little too late. It is the law that a special election must be held. So now the Republicans can try to fill the empty seat.